Patrick O’Brian published twenty complete Aubrey-Maturin novels in his lifetime, with an unfinished twenty-first published posthumously. The novels are writ large with swashbuckling tales of life in the Royal Navy during the Napoleonic Wars. Thick with naval terminology and period slang, O’Brian is quite effective at transporting reader far away from what comfortable chambers they find themselves and placing them smack on the quarterdeck of a ship of war. O’Brian’s novels are far from high-minded and haughty literary endeavor. They succeed as great historical novels through the skill of O’Brian’s narratives, not the cleverness of his prose. Like a true saltwater-in-the-veins sailor, they lose direction slightly when characters find themselves on land for extended periods, but pages fly when O’Brian throws his characters into pitched battles with superior foes (as he always does — O’Brian treats his sailors savagely, always requiring them to beat tremendous odds). The film adaptation of 2003, Master and Commander: The Far Side of the World, directed and co-written by Peter Weir, is a medley of plot elements taken from multiple O’Brian novels, all woven together into a single tale. Weir and his screenwriting partner John Collee did the job well. The central plot was taken from one of the novels, The Far Side of the World, and elements inserted from other books were mostly interchangeable episodes from the periphery of their respective stories. Weir also recognized the inherent weaknesses of a naval epic spending too much time on shore, so the film takes place almost entirely at sea. Like the novels, Weir immerses the viewer in the Royal Navy. The attention to detail in the film is staggering. Everything from uniforms and other costumes, to the ship itself, is rendered in meticulous detail. The ship is a beautiful thing under a full press of sail, and at times the viewer can hear the wind whistling through the rigging. Ship and crew exist in a world alien from that which we are accustomed to. The proximity in which they live with one another is jarring. Privacy is non-existent. Beds, even bunks, are non-existent as well, as the sailors swing from closely hung hammocks while they sleep, swaying in tune and in contact with their neighbors. The ship is populated by both old and young, as the mores of a different time are not glossed over at all. It is shown how common it was for children to accompany adults into battle. The seafaring life is a lifelong commitment for those not press-ganged into service, and training starts at a young age. The ship is the HMS Surprise, carrying orders to track down and capture a privateer operating off the coast of South America. 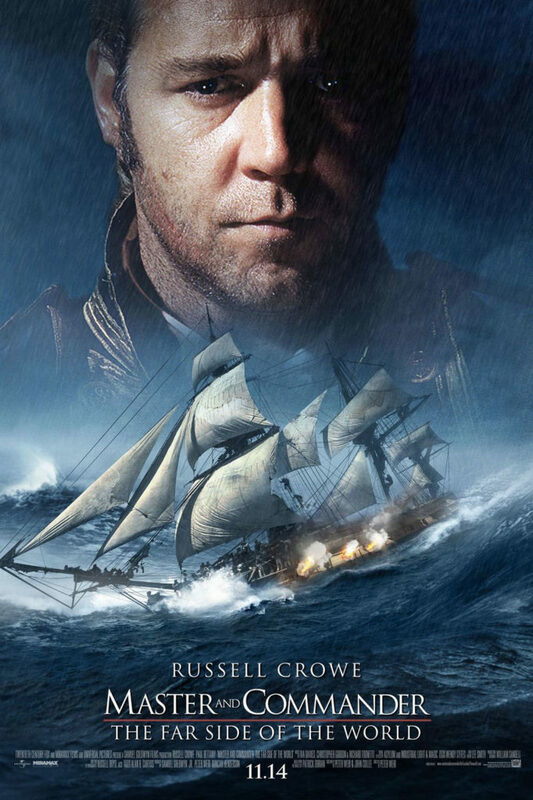 Her captain is Jack Aubrey, played by Russell Crowe. His close friend and compatriot is also the ship’s surgeon, Dr. Stephen Maturin, played by Paul Bettany. If this sounds somewhat familiar, that is because this description is one pointy-eared science officer away from being Star Trek, but beyond the coincidence of a captain and a ship’s doctor being close friends, there is no other resemblance between the two disparate stories. Both men give able performances, with Bettany standing out, as does the rest of the crew. Apart from the officer corps, the crew look and act like a bunch of grog-swilling pirates. None of them can be accused of performing with a lack of believability. Acting as one ensemble, crew melds with ship into becoming a representation of period. On a British ship in the early 1800’s, it becomes impossible to think of there being any other collection of humanity. The plot wastes little time in getting going. A brief caption at the beginning of the film informing the viewer of the ship and her mission is all the character development we get. The story may have been cobbled together from multiple sources, but since these elements consisted mostly of action, the story remains simple. An abundant amount of time spent in buildup would have been unnecessary. An extended chase movie, simplistically explained, the movie consists of encounters between pursuer and pursued, and periods preparing for encounters. The why of the story are left to the imagination of the viewer. A student of history would know the reasons behind the activities of privateers in the southern hemisphere and the Royal Navy’s efforts to combat it, but those reasons are never explored deeply. The viewer suffers none from this lack of context. There isn’t any time to ask why these two ships are trying to blow each other out of the water. It’s just too much fun watching them try. If there was one element of the plot I had a hard time swallowing, it’s the easy-going joy with which the crew has resigned themselves to service in war. They’re not aboard the HMS Pinafore, but the lack of griping at anything with less than superstitious origins seems a bit of a stretch. Even with the ever-present smiles of a zealous crew, Master and Commander is a near-flawless film. It boils down a long string of novels into its most successful elements, and enthralls for more than two hours. It drags somewhat in the middle section, but makes up for it with a climax that is as satisfying in its resolution as the buildup was suspenseful. I couldn’t help feeling while I was watching this film that I was viewing the template by which all further naval films will be judged, whether they be period pieces, new entries in the submarine genre, or even science fiction space epics that are derivative of sea travel. It’s rare to see a big-budget action film done so intelligently. There’s nothing dumbed down here, despite the lack of sophistication in the story. The CGI is restrained and believable, and there is never an instance where the world the film inhabits feels forced or unreal.